Successfully Added Galaxy's Thinnest GPS Portable Navigator (5 Inch Touchscreen) to your Shopping Cart. Are you waiting to find the GPS unit right for you? Your wait is over. This GPS navigator features all the powerful navigation functions you need. Spoken instructions allow you to keep your eyes on the road while you drive. Automatic route re-calculation gets you back on track quickly if you make a wrong turn. The choice of two-dimensional (2D) or three-dimensional (3D) mapping lets you find your way more easily. "Night Mode" allows your eyes to focus on the screen more comfortably in the dark. Use the FM transmitter to route the audio from this GPS unit directly to your vehicle's speakers. This GPS unit will even help you locate the malls, cafes, shoe stores, and bars nearest to you. You may even find some places you didn't know existed! But wait, there's more! This unit is also a fully functioning handheld portable media player (PMP) with rich multimedia options. Supporting many file formats of your favorite music, videos, pictures, and e-books, this GPS unit will keep you entertained everywhere you go. Play audio files with the earphones, the built-in speaker, or through your car's stereo system. Enjoy MP4 and other video clips on the 5 inch screen. The Galaxy's Thinnest GPS Portable Navigator lets you find your destination and have fun while you travel. If you're tired of bulky, hard to use GPS devices, then this GPS unit's slim profile and slick navigation menus are perfect for you. At just 13mm thick, this GPS device slips into your pocket easily to follow you everywhere. 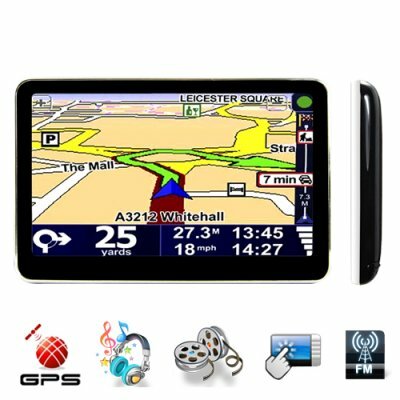 Big, colorful icons and a highly responsive touchscreen let you navigate through your GPS and multimedia functions quickly and easily. This amazing GPS device is available for single piece or bulk quantity orders. Get one today to test drive for yourself, then order in bulk to enjoy savings on per item cost and shipping. Put it on eBay, and we'll even dropship it straight to your customer's door! From your best source of high quality, low price gadgets, Chinavasion. Night mode, stored locations, address look up, etc. Search points of interest by category, such as restaurants, accommodations, ATMs, shopping, etc. Does this portable GPS navigator support my language? The GPS Navigator has an OSD menu with several languages. The menu is different than the GPS software. You should purchase a GPS software that supports your countries native language. Does this unit need an external antenna? No. It has a powerful internal antenna. It does not need an external antenna. This GPS unit has an FM transmitter, what is that? An FM transmitter lets your GPS unit send its audio to your car's speakers via your car's FM radio receiver. This lets you hear the audio from your GPS device clearly. How do I get started using this GPS device in my country? Just load up the GPS program map for your country with the SD card and turn the device on. The first time this device acquires your location, it may require up to 5 minutes. After that, it updates GPS information quickly in real time. How do I install a map for my country? Please click "News" at the top of this page to see our blog article "Install GPS Maps On GPS Handheld Devices, The Step By Step Guide." on 2009-10-30 09:35:20 top-quality production!!! This GPS device succeeds in all the requirements I had. It easily fits in a coat pocket, has its own battery power with choice of 'standby' and 'off' (you can see a glowing led when in standby mode). Resume from standby seems to be virtually instant. The large (widescreen) screen is bright and very clear with just the right amount of resistance for touch screen use. I haven't used it longer than 1 hour on battery power so cannot comment on its battery life. However, the screen backlight is so bright I have turned it down to its lowest setting and haven't had the need to increase it. This will extend the battery life. The device comes with a free 2GB microSD card already installed. According to the instructions it will take up to 4GB microSD cards. IGO 8 GPS software takes around 1.8GB so I do not recommend buying anything less than 2GB cards if you intend to use other GPS software with a range of Country map data. It also comes with a very robust windscreen holder flexible enough for most positions and Mains, Car and USB power cords. On the subject of IGO 8 , I am impressed with it and the GPS device responsiveness redrawing the screen. The animation is well done and automatically zooms in when traveling slowly (or stopped) and zooms out when moving at high speed. I am especially pleased with the overhead road signs that appear when approaching bifurcations making it very easy to select the correct lane. I don't feel the need (currently) to use any other GPS software but for purely interest's sake may load up TomTom just to see the differences. The position accuracy is far superior to my previous GPS system. I do not know if this is due to the GPS device and satellite lock or IGO 8 software - or a combination of both. In any event it is a great improvement on my old GPS that sometimes failed to inform me of a road exit to take because it was so slow and not accurate in positioning. I have a great portable MP3 player so feel no need to use this device for that purpose at this time. Since I am the driver for all long journeys I have no current use of the video abilities of the device either. I may download a few Ebooks to try since the screen is bright and clear (and big!). To conclude: For my needs the device gets 5 stars especially since it does what I want for less than the price of one tank of fuel. This is a very good GPS. It comes with IGO preloaded with maps for all the world. Nevertheless, it has limited support for Greek fonts should you choose to install another program. For example Destinator (any version) and Navigon won't work as the Greek fonts that are required for these programs are missing. If you stick to IGO there should be no problem.